Venezuela's socialist President Nicolas Maduro faced international condemnation on Monday after his re-election in a vote foes denounced as a farce that cemented autocracy in the crisis-stricken oil-producing nation. 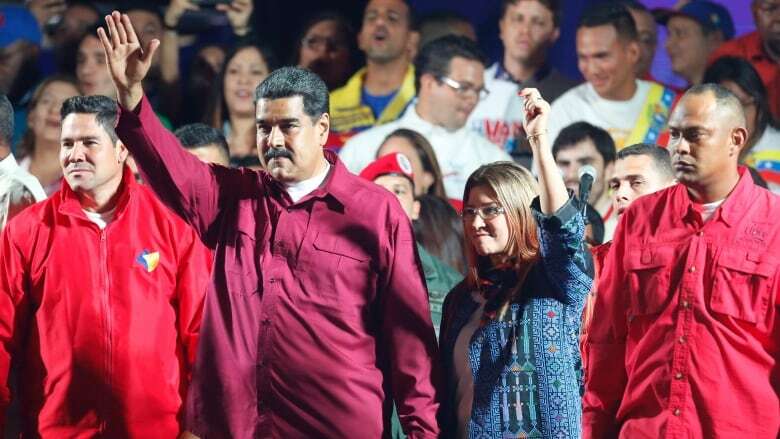 Maduro, 55, hailed his win in Sunday's vote as a victory against "imperialism," but his main rival alleged irregularities and refused to recognize the result. In a blistering statement, the 14-nation "Lima Group" of countries in the Americas from Canada to Brazil, said Monday it did not recognize the legitimacy of the vote and would be downgrading diplomatic relations. The group deplored Venezuela's "grave humanitarian situation" behind a migrant exodus and promised to help co-ordinate with international financial bodies to crack down on corruption and block loans to the government. In a statement on Monday, Canada's Foreign Affairs Minister Chrystia Freeland called the election "illegitimate and anti-democratic." "The Maduro regime has once again failed its people by restricting Venezuelans' rights and liberty and by preventing the free participation of opposition parties," she said. "Canada rejects the Venezuelan electoral process and its results as not representing the democratic will of Venezuela's citizens." Venezuela's mainstream opposition boycotted the election, given that two of its most popular leaders were barred from running; authorities had banned the coalition and its various parties from using their names, and the election board is run by Maduro loyalists. Turnout was under 50 per cent. Thousands of Maduro supporters, many wearing red berets, hugged and danced outside the Miraflores presidential palace, showered in confetti in the yellow, blue and red colours of the Venezuelan national flag. "The revolution is here to stay!" a jubilant Maduro told the crowd, promising to prioritize economic recovery after five years of recession in the OPEC nation of 30 million people. "Let's go, Nico!" his supporters chanted until after midnight during party scenes in downtown Caracas. "We mustn't cave to any empire, or go running to the International Monetary Fund as Argentina did. The opposition must leave us alone to govern," said government supporter Ingrid Sequera, 51. She wore a T-shirt with a logo featuring the eyes of Maduro's socialist predecessor, the late Hugo Chavez. Senior U.S. State Department officials declared Sunday's vote a "sham" and repeated threats to impose sanctions on Venezuela's all-important oil sector, which is already reeling from falling output, a brain-drain and creaking infrastructure. Spain, which has led European Union criticism of Maduro, also weighed in. "Venezuela's electoral process has not respected the most basic democratic standards. Spain and its European partners will study appropriate measures and continue to work to alleviate Venezuelans' suffering," tweeted Prime Minister Mariano Rajoy. However, regional leftist allies of Venezuela, from Cuba to Bolivia, sent their congratulations. China and Russia, which have both poured money into Venezuela in recent years, were also unlikely to join in the international condemnation. The election board said Maduro won 5.8 million votes, versus 1.8 million for his chief challenger Henri Falcon, a former governor who broke with the opposition boycott to stand. Turnout was 46 per cent, the election board said, way down from the 80 per cent at the last presidential vote in 2013. Suggesting turnout was even lower, an electoral board source told Reuters 32.3 per cent of eligible voters cast ballots by 6 p.m. local time as most polls shut. The government used ample state resources during the campaign and state workers were pressured to vote. Falcon called for a new vote, complaining about the government's placing of nearly 13,000 pro-government stands called "red spots" close to polling stations nationwide. Mainly poor Venezuelans lined up to scan state-issued "fatherland cards" at red tents after voting, in hope of receiving a "prize" promised by Maduro. Some anti-government activists said the opposition coalition should have fielded a candidate regardless of how uneven the playing field might be. But the opposition coalition, which has been divided for most of the duration of the "Chavismo" movement founded by Chavez after he took office in 1999, appeared united after the vote and said its boycott strategy had paid off. "I implore Venezuelans not to become demoralized, today Maduro is weaker than ever before. We're in the final phase of a tragic cycle for our country. The fraud has been exposed and today the world will reject it," tweeted opposition leader Julio Borges. It was not yet clear what strategy the opposition would now adopt, but major protests seem unlikely given widespread disillusionment and fatigue. Caracas was calm and many of its streets were empty on Monday morning. Protesters did, however, barricade some streets in the southern city of Puerto Ordaz, drawing teargas from National Guard soldiers, witnesses said. Maduro, who faces a colossal task turning around Venezuela's moribund economy, has offered no specifics on changes to two decades of state-led policies. The bolivar currency is down 99 per cent over the past year and inflation is at an annual 14,000 per cent, according to the National Assembly. Furthermore, Venezuela's multiple creditors are considering accelerating claims on unpaid foreign debt, while oil major ConocoPhillips has been taking aggressive action in recent weeks against state oil company PDVSA, as part of its claim for compensation over a 2007 nationalization of its assets in Venezuela. Though increasingly shunned in the West, Maduro can at least count on the support of China and Russia, which have provided billions of dollars' funding in recent years.